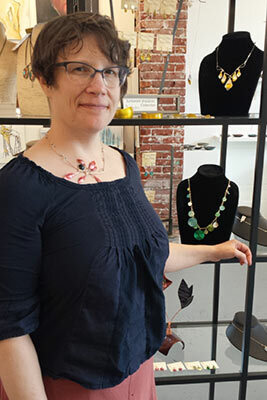 The imagination of Concordian Mandy Allen results in colorful, creative and unique anodized aluminum and silver jewelry as well as botanical inspired wall art. Mandy Allen Metal Arts is a successful and popular line of jewelry that is sold locally and nationwide. 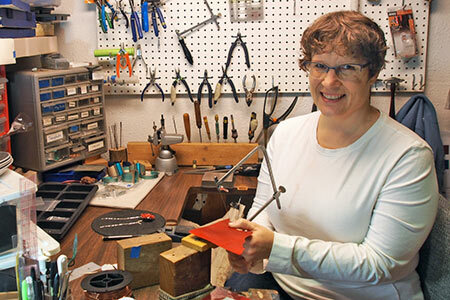 Although the transformation from plain aluminum sheet metal to colorful three-dimensional shapes and designs occurs right here in Concordia, the seeds of creativity were planted by Mandy’s 3rd grade teacher who recognized her artistic talent and encouraged her to pursue the arts. After attending Los Angeles County High School for the Arts, Mandy went on to study at Humboldt State University. There she gained a strong understanding of design and technique. She also met her husband, which is fortunate for Concordia, because his job transfer brought them here in 2004. Mandy mixes and combines luminous dyes in a way that no one else does. She uses hammers and stakes to form myriad shapes and forms. Her jewelry is lightweight and comfortable to wear. She said her design inspirations include botanicals, and Japanese textiles and design motifs. “The metal working process is very satisfying to me. I am continuously learning about the capabilities and the possibilities that metal has to offer. As I respond to the metal, the piece will evolve and come into focus. “I feel a piece is only successful when I achieve a balance between craftsmanship, composition and artistic expression,” Mandy added. She’ll sell her work at several art galleries and juried craft shows this summer. You can also find Mandy Allen Metal Arts at the Salem Art Festival in July, Local 14 in September, and at the Wild Arts Festival in November. To see her collection of earrings, necklaces, bracelets and wall art, visit AllenMetalArts.com or Allen Metal Arts on Etsy. After living east, south, north and west, Marsha Sandman is home at last. And she wants to hear your story. Contact her at MarshaJSandman@ gmail.com.